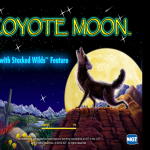 Coyote Moon is one of IGT’s most beloved slot machine games. This hugely popular nature themed slot does the rounds as some of the biggest and best online casinos on the net. 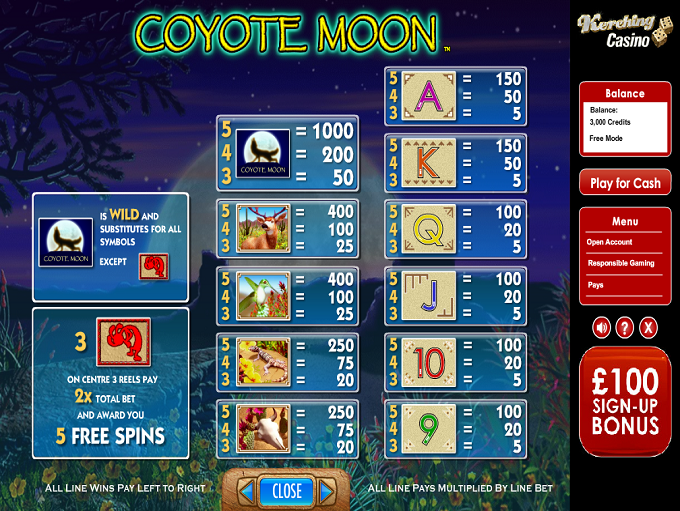 Coyote Moon offers a 5-reel, 40-line structure, and unlike many other IGT developed slots, players can actually adjust the number of lines they wish to play with on the reels of this game. Coyote Moon’s wagering range rises from a floor of just 0.01 per line per spin, up to a ceiling bet of no more than 2,000.00 per spin. In return for a wager in that rather broad wagering range, you can win as much as 1,000x your total bet. 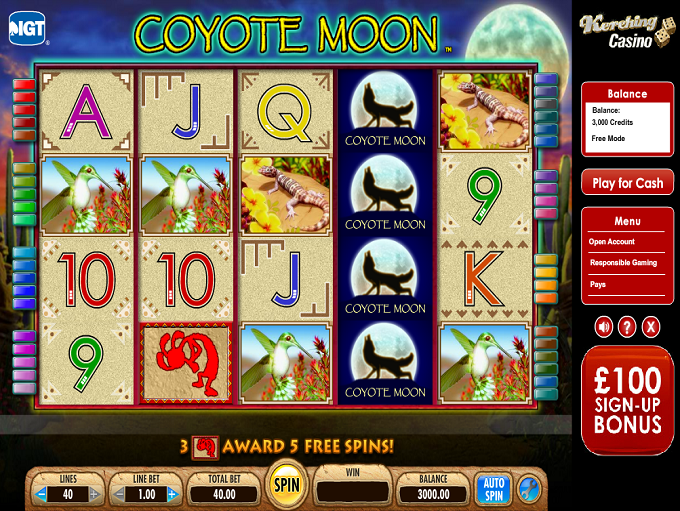 To do, players will need to line up 5 of the Coyote Moon symbols on any active payline in the slot machine game. 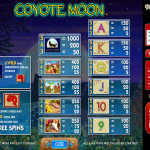 The Coyote Moon symbol does far more than just offer you the biggest cash prize in the slot machine game. It can also act as a substitute symbol – a wild icon. This wild symbol can replace all other symbols in the game, except for Coyote Moon’s scatter icon. Scatter icons appear as Native American symbols. These beautiful looking symbols can appear on the second, third and fourth reels of the slot. If you can land them on all three reels at once, you will pocket a scattered cash prize worth double your total bet. Players can also pocket a total of 5 free spins with these symbols. The special bonus round in this slot is known as the Rising Moon bonus. It is essentially a free spins bonus feature, and a fair and predictable one at that. Players will find that the scatter icon changes colourful and shape in this feature (from red to green). These symbols can now offer you an additional 5 free games when 3 appear on the reels during the free spins bonus, as well as double your total bet. Players will also note that the standard paying symbols have gone into “night-time mode” during this feature, which is played on a different set of reels. 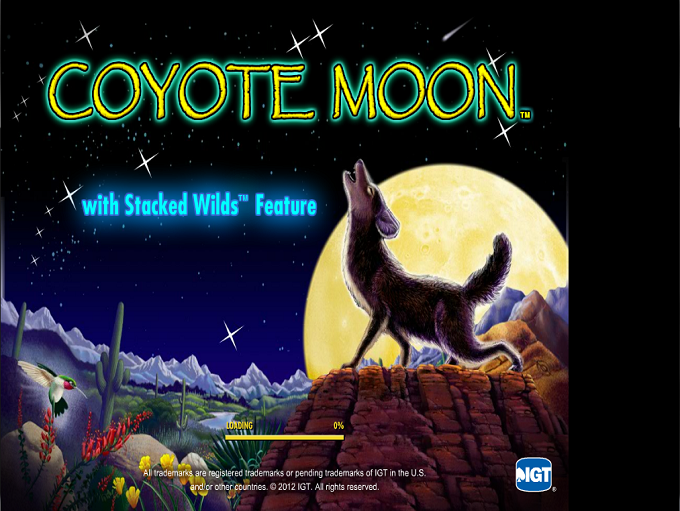 Although its bonus rounds may not be out of this world, for some reason Coyote Moon has remained immensely popular with IGT slot players. 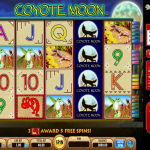 The big wins that Coyote Moon delivers and the frequency of them certainly make this slot well worth a look. How to Indulge in Slot Tournaments?